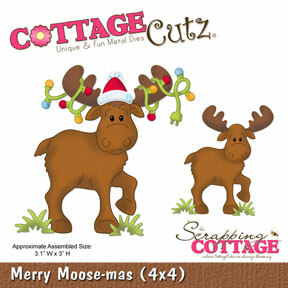 On my card I used the DARLING CottageCutz Merry Moose-Mas Moose he is super CUTE!!! I colored him with Creative Inspiration Paints, and added some black pearls for his eyes. Behind him I stamped some tree's and colored the sky all with CIP's. Here is a close up of the CottageCutz Merry Moose-Mas Moose. Thank you for stopping by and enjoy your day!! Cheryl- cute little Christmas deer. Your moose is so cute. I love that die. He is just adorable. I love those Cottages too! I flipped when I saw them..lol Cute card Cheryl.